States can really build a reputation behind the industries that dominate their economy. When you think of Iowa, you think of farming. When you think of Nevada, you think of gambling on the strip in Las Vegas. That makes this map from HowMuch.net a fascinating way to glance at the nation. 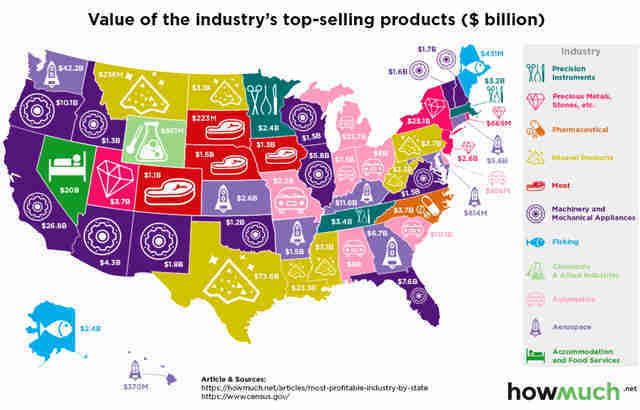 The team at HowMuch.net put this map together after digging up numbers from GoBankingRates, which pulled 2017 U.S. Census Bureau data "to determine the value of each industry's products," with industries defined using Harmonized System codes from the World Customs Organization. With that data, HowMuch.net color-coded the industries and built the map you see below. Many states feature industries that you likely could have guessed before looking at the map. 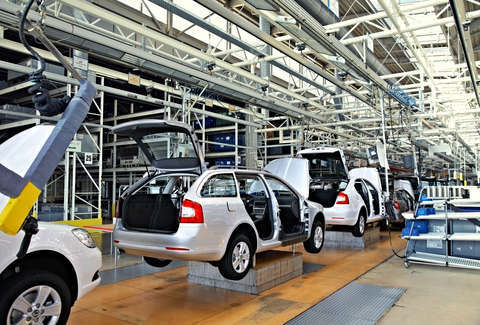 Michigan and a couple surrounding states are still dominated by the car industry. Mineral products thrive along the western edge of the Gulf. Maine and Alaska depend heavily on fishing. Only a couple of states featured industries that were in the top slot for no other state. Nevada was the only state where accommodation and food services took top billing. (Hey, Vegas.) Meanwhile, Wyoming had chemicals and allied industries at the top of its list. Check out the map above to find your state's specialty.